Not long ago Patrick outlined a proposal for gradually extending the proposed Pukekohe to Papakura shuttle train into the Waikato, to eventually end up with a Hamilton to Auckland service. That is a great idea. The simple reality is that big and useful transport projects almost always start small and get expanded piece by piece. It’s not like any one of our motorways were built in one go, let alone the whole network. Indeed Spaghetti Junction was constructed in stages over thirty years. Similarly the rail network has gone through much iteration to get to a fully electrified network. First refurbished diesel trains, then Britomart, then Western Line double tracking, then the rest of project Dart, then suburban station upgrades, then electrification and new trains. Soon, hopefully, the City Rail Link will top it all off. Where the former big rapid rail schemes failed, inch by inch progress has succeeded. However it is a slow and often painful process, particularly when other very expensive projects seem to get funded so easily. In this post I wanted to look at the big bang option for intercity rail across the Waikato and Bay of Plenty. What if a package of funding for regional development suddenly appeared? What if some cabinet minister decided to buy votes with a high profile infrastructure package (please be my guest! ), or indeed if they wanted a cheaper rail project for rural areas to obfuscate the delays for delivering the killer app for urban rail in Auckland? So this is an estimate of how we might do an upper North Island rail service if we had a bit of money. I’m not talking fantasy land levels of cash for high speed bullet trains, but rather what might be realistic with a relatively small, but significant, funding package. What would work, and how much would it cost? (note, this post is a bit wordy and nerdy, so feel free to skip to the end). First of all we need to work out what sort of train service we should be delivering. A simple but not always understood fact is that all good transit lines do many things at the same time. A line that serves just one market never gets particularly efficient or well used, it’s too stuck to the ebbs and flows of a small pool of customers. Take the Northern Explorer for example. It’s now targeted squarely at a luxury tourist market who have time to sit back and take in the scenery… and now it only runs a couple of times a week. Regular commuters from Hamilton to Auckland, who want quick and reliable peak-time trips timed to serve business hours in Auckland on weekdays. So it needs to be quite fast, timed to arrive and depart Auckland at the right times, and probably needs a range of departures as commuters can’t guarantee they will always make a given service. Regular commuters from the towns of the Waikato to Auckland. They want the same things as above, but naturally the thing they would want the most is to be able to catch the train. This means that the service has to also stop in the Waikato towns and can’t just run express from Hamilton to Auckland. Here we might also consider university students who want to live at home in a small town, they’re similar to work commuters but would tend to have later starts to their day (and often later finishes too). Non-commuters from Auckland and the Waikato to Hamilton, and vice versa. These people might be business users, tourists or just local residents wanting to get to the big smoke for shopping, events, healthcare or whatever. These groups might not want to be on the train at dawn for a regular commuter, but would rather have some options for travel across the day and evening. Tourists, both domestic and international. Tourists are the reason I think we should consider trains through to Tauranga and Mt Maunganui as well as Hamilton. International tourists expect to be able to catch trains instead of flying for relatively short distances, and enjoy the scenery and comfort along the way, and the Bay of Plenty is a big market for this. Likewise local tourism is a big but untapped market for trains. A weekend away at the Mount becomes an easy option when you can sit back on the train rather than spend hours behind the wheel. This suggest a daily return train between Auckland and Mt Maunganui is a good inclusion (if not as frequent at the Waikato leg), not least because it would connect Hamilton and Tauranga too. If we put these requirements together, there is a relatively long list of service characteristics needed to serve them all. We need multiple peak time departures from Hamilton to Auckland in the morning, and back again in the evening peak. We also need regular departures in both directions across the day, and fairly late into the night. We need a train that can take people from Auckland down to Tauranga and the Mount and bring them back again. Furthermore for the idea to work we need to do it all efficiently and cheaply. It has to be cheap and efficient to keep ticket price down to a level that is competitive with driving and flying, but likewise it has to be fast and frequent enough to do the same. It also has to be a comfortable and enjoyable experience, and a reliable and convenient one. It also can’t rely on a heap of new infrastructure or capital investment, because we’ll never have hundreds of millions to throw at this. So can it be done? I think so. The key to intercity rail is to work with what we have already, and design efficient operations from the outset. Then the money can be spent where it counts, probably on new vehicles and a few new stations. Let’s start by blocking out some basic characteristics to estimate a timetable, stopping pattern and the number of trains needed. The old Waikato connection did the Hamilton to Auckland run in two hours. I’m going to assume that with some new trains and careful planning we can do the same still (this might need the third main in Auckland to ensure a decent run time). On the other side, the trip from Hamilton to Tauranga was about an hour and a half. Here I’m going to assume we could extend the train to Mt Maunganui and still do the run in an hour forty-five. At the end of each run there needs to be some layover for timekeeping, crew breaks and a quick service, I’ve assumed 30 minutes there. That might not be perfectly accurate but for the purposes of discussion that makes everything fall into convenient two hour blocks which helps us easily conceive the timetable. So four hours plus layover return Auckland to Hamilton, three hours plus layover Hamilton to Mt Maunganui, which also means three and a half hours from Auckland to Mt Maunganui and vice versa. It’s also simple for understanding crew requirements, each crew could do two short return trips or one long one to complete an eight hour working day. I’m also going to assume that one intercity train each hour into Britomart can be accommodated with the current timetable. That’s obviously fine across the day and on weekends, but might be a bit tight for two or three peak time arrivals on weekdays. The main constraint is that with a thirty minute layover at Britomart the intercity trains would more or less need a platform to themselves, leaving only four for the suburban services. I think that should be fine. Twenty suburban trains an hour across four platforms is only five an hour each at the busiest time of day, hopefully quite achievable with our quick new EMUs. Now to consider where the trains are based. Given that Auckland is the only place in the upper north island that has passenger trains it seems the logical choice for the home depot, but on closer inspection I don’t think that’s the best place to keep them. Recent proposals for Waikato trains have been lacking because they propose to use Auckland based trains and crews. The problem here is that the first job of the day is to get Waikato commuters up to Auckland. That means you end up running trains down to Hamilton empty at about four in the morning so that they are in place in time to pick up the first northbound commuters. And in the evening after dropping the commuters home in the Waikato, you have to run your trains back up to Auckland again. As nobody wants to go from Auckland to Hamilton at four in the morning that’s a big wasted expense already: paying to run empty trains back and forth between cities. For that reason, I’m proposing that all the trains and crews be based and stabled in Hamilton. That way they are there and ready to take the first run north each day, and are back at home base after the last return back in the evening. So I’m assuming that a suitable stabling and staff facility can be accommodated at Frankton yard. What more? Well there will need to be some stations. In Hamilton I’m going to assume the existing stop at Frankton, plus a stop in the mothballed city underground station to be nice and convenient for business users (this would need refurbishment). However, because the city underground station is only one track on the main east coast line you couldn’t terminate trains there without blocking the freight line to Tauranga all the time. So I’m going to assume a new twin track station should be built east of Hamilton central at Claudlands, this gives a good place to terminate Hamilton trains after calling at the central station and also provides a good place to get on and off. While we are at it lets also assume a new station at The Base in Te Rapa to serve the north of Hamilton. So in Hamilton that’s new stations at Claudlands, Hamilton Central (refurbished), Frankton (existing) and Te Rapa. In the Waikato, I’m suggesting stations should be delivered at all the towns and larger villages: Ngaruawahia, Taupiri, Huntly, Te Kauwhata, Mercer, Pokeno and Tuakau. Some of these already exist, in various states of repair from a full station to the space where a platform used to be. For example, the station in Huntly, although not especially pretty, looks like it could be bought into service immediately. On the Bay side, I’m thinking new stations at Mt Maunganui and Tauranga CBD, one at Omokoroa to serve the growing area there, One at Waharoa to serve Matamata ( unfortunately just a few kms off the line), and at Morrinsville. All up that’s sixteen new or refurbished stations, and one existing. I was recently down in Tauranga and it really is just crying out for rail. The way the line passes through the CBD waterfront along The Strand presents the perfect opportunity for an ideally located station right in the middle of town. 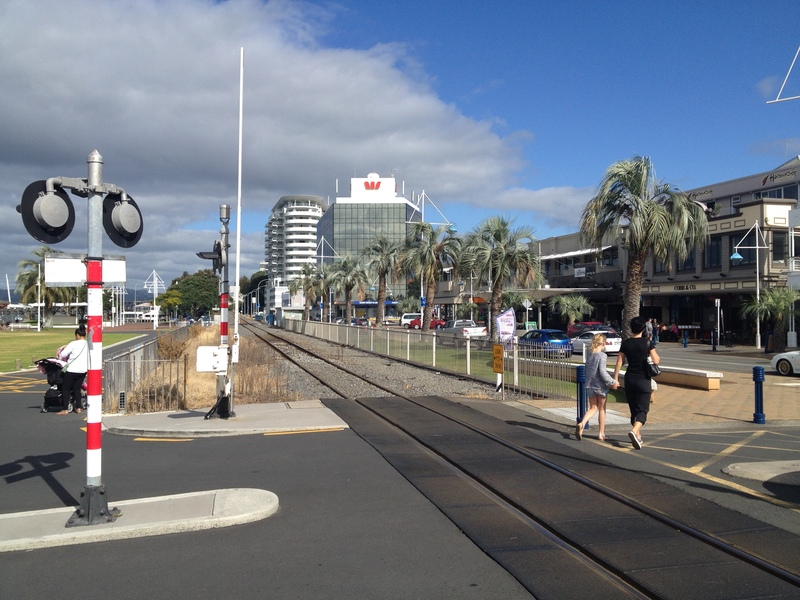 Likewise over at the Mount, the tracks actually run right up to the corner of Rata St and Totara St, at the foot of the Mt Mauganui CBD and retail/entertainment strip. It’s a perfect location, and there is even a disused fire station on the corner which might even be used for the station building. … to Mt Maungaui main street. The tracks stop just behind this disused fire station. For now let’s forget freight locomotives, refurbishing old carriages or the leftover suburban sets and assume we have the funds to purchase some new trains. My suggestion would be to follow the lead of Melbourne and their VLocity trains, which were brought in fairly recently to run a revitalised regional network and have been doing stellar service. These vehicles are diesel multiple units (not locomotive hauled carriages) specifically designed for long distance use. Double ended means no need to turn them around at any point. They are modern, quiet and fast. They would have to be diesel powered to go where we have no wires, but could easily do well over 100km/h where the track allows. The interiors have spacious high back seats, luggage racks, toilets, water fountains and all the things you’d expect on a long distance train. Now Melbourne’s trains are indeed broad gauge so we couldn’t run exactly the same ones, but there are plenty of equivalent examples of narrow gauge intercity DMUs. So I’m suggesting brand new purpose-designed trains that are efficient to operate, cheap to run, and very comfortable and civilised for hours long journeys. While it is true that brand new trains will cost about five million each, we shouldn’t need that many of them. Right, so what would the timetable look like? Well starting from the start, for a useful service I think we need at least three departures from Hamilton to Auckland in the morning peak and three back in the evening peak. This is to give a reasonable range of options for regular commuters, including students and business users. However given the four-and-a-bit hour round trip from Hamilton to Auckland and back, five trains and crews would allow an hourly service to be maintained. We also wanted to send some trains out to Tauranga and back, so we need another vehicle for that too. That brings the total to six. So I’m going to use this to define the fleet and limit the timetable to six trains in service at any one time (In reality that requires seven trains, six trains in service each day with the seventh on rotation for breakdowns and routine maintenance). I’ve suggested that the trains start early in Hamilton at quarter to the hour, and make the two hour trip up to Auckland also arriving at quarter to the hour. They would stay at Britomart for a half hour layover, then return back to Hamilton at quarter past the hour. A fairly decent layover is need to ensure they can keep to schedule even with some delays or disruption, plus having them arrive at quarter to and leave at quarter past makes things convenient for work times and appointments starting on the hour. That means we have return trains from Auckland to Hamilton departing at 5:45, 6:45, 7:45 and so on, arriving at 7:45, 8:45, 9:45 and so on. In the other direction, the first service departs Auckland for Hamilton at 8:15, then 9:15, 10:15 etc. That’s the morning peak taken care of, so on to our other trip demands. Well if we keep that hourly back and forth going all day long that takes care of most of the general trips. Effectively it’s the same service levels all day, that means the peak trains will be nice and full while the off peak ones probably less so. So be it. But recall I was trying to continue some service both ways between Auckland and Hamilton across the day, but also get in some return trips between Auckland and the Bay of Plenty. My suggestion is the first departure from Auckland, the 8:15am, continues through Hamilton and on to Tauranga and Mt Maunganui, arriving at the latter at midday. It would sit there for about an hour while the crew take a break, and then return back to Auckland via Hamilton and carry on for the rest of the day. Also I have scheduled an early morning departure from Hamilton to Tauranga. This could be useful for some commuters, but the main purpose is to position a train for an 8:15am departure from The Mount to Auckland. To give a good spread I’ve also suggested the last arrival at Auckland also be a Tauranga train. If you work back that means the 1:15pm departure from Auckland arrives at Tauranga at 5:00pm, then returns back to Auckland leaving the Mount at 6:15pm and arriving at 9:45pm. This then goes on to return to Hamilton and as the last service of the day, departing at 10:15pm and arriving at a quarter past midnight. A train every hour across the day, both ways between Hamilton and Auckland. These start early from Hamilton for the commuters, and return late from Auckland for people going to shows and events. 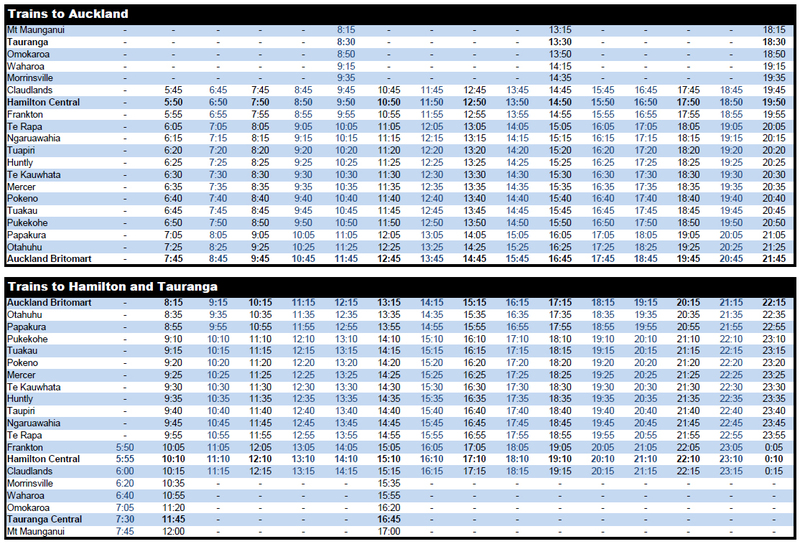 One train each way between Tauranga and Auckland and vice versa in the morning, and another each way in the afternoon. A fifth service runs back from Tauranga to Auckland in the late evening to make day trips work. That’s the full schedule for weekdays. For Saturdays, Sundays and Public Holidays we can probably drop things a bit to save costs. For the weekend schedule I’ve dropped down to a train every two hours between Hamilton and Auckland, and vice versa, and dropped the early Tauranga to Auckland train. I have however kept the morning train from Auckland to Tauranga, the afternoon train each way, and the evening train back from Tauranga to Auckland. So the schedule should work for commuters, tourists, business travellers and general travellers alike. Putting that all into a timetable it looks something like this. On weekdays both the black and blue services would run, on weekends only the black would be operated. The beauty of having all the trains and crews based in Hamilton is that you can easily manage your staffing schedules. The nice return legs of about four hours each means each crew can do to two shifts to complete a days work, with an hour or so break between. I’ve allowed one hour breaks at Tauranga for those crews, while the rest would rotate, hopping off at Hamilton for their break and get back on the next scheduled service an hour later. Adding up that timetable we get 27 shifts a week, each four and a bit hours long. If we assume a crew member can do ten shifts a week, 48 weeks a year, we have the need for fourteen crews. Each crew would need a driver, and an on board train manager. I think that’s all that is needed. If there were café services and the like there would need to be more staff, but hopefully that would pay for itself. For now I’m going to keep things cheap and efficient with only one driver and one other crew member to check tickets and look after the customers. So how much would it cost to set up? Time for some sums. The timetable would needs seven vehicles, six in service and one on rotation. At $5m each that is $35m for vehicles. The other significant capital cost would be the stations. These need only be fairly basic platforms and shelters for the most part, with a little lighting and passenger information. I’ve not assumed any big park n rides or anything as part of this. At Mt Maunganui, Tauranga, Claudlands, Hamilton Central and Te Rapa there is a fair cost to build a new and fairly substantial stations, or in the case of Hamilton Central to refurbish one. Allocating a million dollars each gives $5m. At the other ten new stations I’m allocating half a million each for a more basic facility. That’s another $5m, or $10m in total. Assuming that the existing rail network can handle these trains, and that they can be stabled in Hamilton, brings the total capital investment required to $45 million dollars. That’s not much compared to many other strategic transport projects, well within the realms of reason for an election bribe! It’s also small enough that sharing it between the councils of Auckland, Waikato and Bay of Plenty could be a realistic funding programme, even without central government help. Capital costs for trains and setting up is one thing, a one off cash injection… but operating expenditure is for ever. The bigger question is how much would this network cost to run, and how much tickets would have to cost for it to break even. Starting with the staff, fourteen crews consisting of a driver cost of $120k a year and a train manager of $60k works out to $2,520,000 per annum in crew costs. To that I’m going to add another $1,000,000 a year for management staff, corporate overheads and marketing. The third main cost is fuel. Using those Melbourne DMUs as a benchmark, they consume 1 litre of diesel per km. The current price of $1.50 a litre multiplied across the proposed timetable and route distances results in $2,760,480 per year in fuel costs. All up this gives an estimated operating cost of about $6,280,000 per year. The one major thing missing from this equation are track access charges. I’ve got no idea what they might be or how to estimate them. For now let’s assume that they are waived for the first year while we are getting up and running. All that translates to an operating cost per segment of $483 dollars. By a segment I mean a one-way trip between Auckland and Hamilton, or Hamilton and Tauranga, or vice versa. A return run from Hamilton to Auckland and back would therefore cost just a touch under a grand to operate. So what does that mean for tickets? I’ll assume an average ticket revenue of $15 per segment. A return ticket from Hamilton to Auckland and back would be $30, while a return from Auckland to Tauranga would be $60. In reality you’d set the actual cash price a bit higher, paying GST and the like, and offer discounts for regular commuters, students and what not. Likewise shorter trips from the smaller towns would be a bit cheaper. Specifics aside, at that nominal price you need to achieve an average of 32 fare paying customers per run to break even. That doesn’t sound like that much at all. Given that those trains can seat 215 customers, that’s only an average occupancy of about 15%. In reality you’re unlikely to see an even average like that, rather you’d probably have the peak runs filling right up while the off peak runs would be fairly empty. But what does that mean in people terms? Given that most people will make a return trip, and that the long distance tickets would cost about double the Hamilton to Auckland ones, we can do a bit more figuring. After a little fiddling with the numbers I estimate the break-even point on operating cost works out to be about 420 return trips a day between Hamilton and Auckland and another 80 return between Tauranga and Auckland, on a normal weekday. All up, 500 daily passengers (making 1,000 trips) seems to be about right for cost recovery. More than that and it starts to turn a profit. Of course if we were happy to subsidise operations by a few million a year and only require a farebox recovery ratio of 50%, then we’d only need about 250 passengers making 500 trips a day across the network. For an initial outlay of $45 million we could have brand new trains running every hour all day between Hamilton and Auckland, plus morning and evening trains to and from Tauranga and Mt Maunganui. These trains would serve simple, but functional stations at a dozen towns in the Waikato and Bay of Plenty, plus Auckland, central Hamilton, the Tauranga CBD, and Mt Maunganui. Compared to what we spend on intercity highways and suburban motorways, $45 million ain’t much capital to outlay on a system connecting half the population of the country. Trains would take two hours to travel between Auckland and Hamilton, and three and a half hours Auckland to Tauranga. Those times are competitive with driving, particularly at peak times, especially if your interested in enjoying your time (or working) instead of holding the steering wheel. They’re also time-competitive with flying between the main centres once you factor in airport hassles. To get thirty-two departures each weekday and a few less on the weekends would cost $6 million a year to run. Without any subsidy it would take around 500 fare paying passengers each weekday to break even, which translates to a fairly measly 32 customers on each run, on average. Is that really so far fetched with new trains giving frequent all day service? Excellent work, Nick. Such a shame this is the section of the North Island that isn’t electrified. What would it take (aside from a dedicated line within the Auckland network) to achieve 160 kph running speeds? Not just track upgrades but phenomenal track upgrades in terms of realignments, straightening and improvement in the overall quality of the track itself. It would also require constant maintenance before bigger faults develop and really quick repair work, in other words that day when a fault is identified. In Auckland for example there are some speed substantial restrictions that remain for a year or more with no repairs to the track, I assume owing to lack of money and or lack of motivation, so that’s what you are up against.. This is a great idea but there is a huge lack of political will power and foresight at this time and belief in rail as a viable alternative. I”ve taken the V/Locity service from Melbourne Southern Cross to Ballarat, and it is great. Everything a modern regional diesel link should be – great choice of example. There will be in the archives of the Victoria Department of Transport, a range of documents that provided the business case to build Vlocity. I will see what I can locate. I believe the original plan was a much lower speed standard sort of an upgrade but the business case actually favoured the “big bang”. That may just provide some good source material to apply to Auckland – Hamilton – Tauranga. As per some other comments, I think you’ve under-estimated the costs. But, I also think you have under-estimated the benefits. The current NZ government will not consider (non-metro) rail services in any terms other than a narrow profit/loss balance sheet focus. However, we know the NZ government does not use the same set of rules for their beloved RoNS roading projects, neither is it the way intercity rail is assessed overseas where WEBs are an integral part of the balance sheet. I understand that you need less stops in Auckland to make it work, but why not stop at Papatoetoe so tourists especially could rail/bus from Waikato to Auckland airport? If this proved a success it would really increase the case for the potential airport connection to be built as a through station. Trains from Auckland, through the airport and onto the Waikato/BOP region would be a winner for both commuters, tourists and AIA. Especially if a Rotorua line could be added. I picked those stops based on the idea that the train would use the third main between Papakura and Otahuhu… and not knowing if the third main would have any platforms or if it would just be a freight focussed bypass. Papakura and Otahuhu will provide a great range of connections to local buses and the rest of the suburban rail network, although admittedly the airport is the glaring exception. Papatoetoe would make a good addition. I would also recommend a station at Ruakura, maybe by Ruakura Lane (the access road to the ag research station). That would put the station less than 1 km flat walk from the university campus boundary, and close to Hamilton East studentland. One thing is for sure, students will walk to catch a bus or train, so a Ruakura station would open up a huge potential market. Operationally, it might also be an easier place to build a double track terminating station (for Auckland-Hamilton trains) than Claudelands. 7 vehicles equalling $45m? Seven three car sets or seven four car sets? You’ll need one more, try 8. I think DMU’s are a great idea but arent diesels shortly to be banned from Britomart so perhaps a Strand arrival via Newmarket? It is an idea which is worth considering. Another is that a DMU lower track force can lead to higher speeds without major work to the track. I had assumed seven three car sets. Why would there need to be one more? I don’t know about diesels banned for Britomart, naturally there won’t be many once the fleet is fully electric but there will still be the Northern Explorer. Haven’t heard any suggestion that that gets shut down or relocated. We are somewhat unique in having an underground central city terminus capable of taking diesel trains, so lets use that to our advantage. Yes I’ve just realised my vehicle costings come from the equivalent of what Melbourne spent on their two-car DMUs before they upgraded them with a third car as a middle trailer. So start with two car DMUs at about $5m each, with the option of adding a third car for another $1.5m or so when needed. Would we? Current TranzScenic fleet aren’t level boarding, even the brand new ones. Perhaps a ramp/lift option would be sufficient. But Nick’s plan above is a lot sweeter. In general I’m all for doing things properly. Either way there’s two opportunities to pursue. I can’t help feeling that the BOP addition is a really important improvement. The Sunseeker or something. Adds a layer of appeal to the more quotidian AK-Ham run, especially in terms of marketing to tourists. And if KR are planning to lift traffic on that route by 50% additional sections of double tracking are likely on the cards already. Especially in an environment where regional development ideas are becoming more vital this has the virtue of trading off the power of the growth of Auckland but enabling more people to live in country towns, as well as growing employment at Frankton. One of the things starting to happen in the USA, is that freight railroads and the passenger operator Amtrak are starting to work together on improving the infrastructure in a way mutually beneficial. For Auckland – Hamilton – Tauranga, an upgraded Railway-of-National-Significance might include a re-built track-bed to allow higher axle loads along with one or two deviations to reduce sharp curves that slow down both passengers and freight. It should be noted that parts of the railway track-bed (the lower ballasted bits) won’t have been touched since the railway was first built more than a century ago. Creating a heavier duty, and more stable track in general will ensure far fewer summer heat-40s, and facilitate higher speed limits for passenger rail. At minimum, a general railway upgrade needs to happen along the Auckland-Hamilton-Tauranga corridor to restore competitive advantage lost to road in the RoNS programme which will unless addressed, impact on future rail freight revenue. At best, an enhanced railway upgrade can also be a very effective regional development tool with fast passenger rail sharing the tracks with much improved and vastly more efficient rail freight, carted by larger freight locomotives all travelling on more stable, heavier duty rail tracks. And one more point….talking of ports, freight, regional development and fast regional passenger service – might an extension of the rebuild rail infrastructure run through to Marsden Point and Whangarei? Excellent stuff: visionary, pragmatic, useful and well thought out. Sadly, almost totally guaranteed to be thrown out of court by the usual combination of the dead hands of KiwiRail, National party politicians and the Waikato Regional Council. But it could be the basis of a great regional revival, something Labour has proposed. Any comments from Phil Twyford? Having ridden Amtrak, as a tourist, from Vancouver to Seattle, 6:40am to 11:05am which is a tad over the time proposed for AKL –> TGA I thoroughly support this as a workable tourism and commuter venture. The AMTRAK experience was completely enjoyable and had all the virtues of rail travel over road and we arrived in Seattle relaxed and ready for the rest of our day. I think an in train cafe is required, though, especially on the early morning runs. I like the plan. Is it good enough to go to the private sector to finance? If yes then do it. The main problem I can see with this great idea (I would use it to get to Hamilton and Tauranga) is the Metro Port freighters that constantly travel the line. We have 12 MP services at the moment and Port of Tauranga wants to go to 18 rather soon. [Annie says despite the survey, giving New Zealand Transport Agency via SmartGrowth an economic viewpoint on the cost, the chances of a commuter service are very slim in the next 20-30 years as the rail lines do not have the capacity. I disagree with your list Ben, that seems to be a big pile of unnecessary works to add in a train an hour at best. I don’t see why you need a third main to Pukekohe, or even one through Auckland if you are happy to run your new trains slowly. Pukekohe to Hamilton is already double tracked. One long passing loop between Hamilton and Tauranga would do fine for a long time. Yes a Tauranga station would need to be on a second track, that’s hardly difficult given it is flat, open and unconstrained. Not fully double tracked. Decent chunk still single track north Te Kauwhata through the swamp (and single track bridge over the river at Ngaruawahia. yeah, Matt is right. I grew up by the Whangamarino Swamp and it’s single tracked through there. Awesome ideas Nick, but you’ve done what most do, and skipped the hard bit. There are two main hurdles, firstly the framework for operations to exist within, and secondly the operations themselves. You’ve dealt nicely with the second part, but without the first part, it can’t be enacted. The railway network does not have open access. Nobody other than KiwiRail has any right to use the network for commercial services, and so can only do so with permission from KiwiRail, who will only give it in exchange for a healthy profit themselves. The addition of this extra payment to KiwiRail on top of the operational costs will make it a high cost operation, and experience to date at trying to get these things started has shown that high cost hurdle to be too high to overcome. So what we actually need first and foremost is an open access railway network. One where the track access and infratsructure costs are provided by a neutral entity, in which KiwiRail is just another operator, and irrelevant to other operators. Other operators should only be required to pay their fair share for track access, and their own operational costs. They should not have to pay a commercial profit to another operator. The other matter you overlooked is that the ECMT is single track, carrying twice as many freight trains as was the case in the 1990’s. The former railcar times are no longer possible, and the number of paths for additional services are limited, and will have to work around the freight trains. So this means for a comprehensive passenger timetable, double tracking of Hamilton-Mount maunganui will be necessary, which of course will be many hundreds of millions of dollars, and that’s without a second track through the Kaimai’s. As I used to write often on the previous Hamilton proposal, we need that alternate operations framework in place first. Remove the hurdle of having any new passenger operators having to satisfy the commercial imperatives of a freight company first, then start planning the trains. Well yes, I am assuming we either have a Kiwirail who is proactive about passenger rail (perhaps due to a change in the Government Policy Statement and ministerial direction come November), or some new open access arrangement. My guess is the former is more likely. As for the ECMT, are you really sure it requires full double tracking and a second Kaimai tunnel to add three return services a day, spread across twelve hours? That’s one movement every two hours. Ok I see you are talking about a comprehensive passenger timetable, that’s certainly now what I am suggesting. True Geoff, but the means to changing the framework is to propose an actual case where it could be useful. So presenting a case for a service is at once an argument for access to the network. And, frankly, this is or at least should be, the simpler of the two problems. Only requires political will. The lack of space on the line to BOP is the far costlier issue, which suggests getting the AKL-Hamilton section running first. But that change in political will will only come with campaigning. National are against open-access because they don’t want to lose control of dictating how the network should be used. Labour are against open-access because they believe in single state ownership/operation of everything under the sun. So highlighting the need, articulating it to the wider public, and campaigning for it, is probably the best way to go. There were once people who believed the future of telecomunications in New Zealand lay with making sure Telecom was the only party that should have use of NZ’s communications network. Just imagine how far behind we would be if that had happened. 3G and 4G would be non-existent in New Zealand, and you would pay much more than you currently do for what service was available. Just like passenger trains are near non-existent, and what ones do exist, you pay through the nose to use. That’s what you get with a monopoly. The rail network needs to be “unbundled”, just as the old Telecom network was in the 1990’s. We unbundled the rail network, Geoff. Just like Telecom, the capital asset got sweated and run into the ground. No, we didn’t unbundle it. It was the same monopoly through the privatised years that it was before and after. Great practical post with an idea that will eventually get it’s time. I think you’ve undercooked your station infrastructure costs a little bit, especially when you look at the recent costs on the Johnsonville line for some really basic platform upgrades. Also the funding of inter regional PT services right now is a grey area that would need to be worked through. A lot of those stations already exist in the legal sense, and I am thinking they would be very basic to start with. Little more than a short platform, bus stop shelter and a lamp post. I think inter-city rail is a great idea and you’ve put a lot of thought into this Nick. I’d imagine the biggest issue for potential users would be travel time. A big chunk of revenue for public transport operators comes from commuters so journey time (not just frequency) needs to work for them to be attractive. It’s no good being affordable (or free even) if it takes an age to get anywhere. My experiences of rail commuting and travelling in other countries is that inter-city rail works best by having two levels of service: local and regional. Local services stop at every station. Regional services are like express buses and don’t stop between major centres. If a train stopping at every station between Auckland and Hamilton takes 2 hours (which is not much that different to a car trip) how amazingly and attractively fast would a non-stop train between the two places be? Additionally, express services between Auckland, Hamilton and Tauranga would make the routes attractive for business travel. Fast and convenient travel between major centres could stimulate business growth. Driving to another centre for a meeting may have been a no-go, but a quick rail trip might make it feasible. You can leave Auckland in the morning. Attend a meeting in Hamilton and be back at your desk in Auckland after lunch. All while working on the train both ways. It’s like a physical version of everyone being on high speed broadband instead of dial-up. Shortening travel time was something I considered, but I don’t think it is nearly as important as people make out. If you cut out all the intermediate stops you could realistically save about 30 minutes between Hamilton and Auckland. But that means two things, not being about to get on or off at any intermediate stations (obviously) and blocking out large sections of the main trunk line for long periods to allow the express run. Even if the latter is possible, I don’t think the former is desirable. Being able to travel when you want (i.e. regular frequency) is paramount in my opinion. Who wants to wait two hours to save 30 minutes? That issue comes into play when you consider the realities of opex, track slots and vehicles. Sure, having a local all stops every hour and also an express every hour would be fantastic. But that requires twice the trains, twice the crews, twice the number of slots on the main truck, twice the arrivals at Britomart, etc. So what is the alternative without doubling costs and impacts, run an all-stopper one hour and an express the next? Then you have two hours between services. Maybe we just run one express at peak times, and all stops the rest? Well if you do that with the given timetable you’re taking an all-stops out of action at the busiest part of the peak, precisely when those commuters from Huntly want to get up to Auckland… or if you add an extra peak express on you end up having to buy an extra train and employ a whole extra crew just for one trip. Neither is particularly useful. I think express trains are something to be looked at once you already have a very busy and well used service, they are the end goal. But before then to get affordable, well used and efficient services you need regular frequency to a variety of origin-destination pairs. I don’t think taking a two hour rail trip down to an hour and a half would have that much impact, certainly not as much as having that trip available to all people on the line at regular times right across the day. either way you have the space, the comfort, the ability to work or relax, you get the convenient city centre departure and arrival points, and the lack of mucking about with check in and security. That’s already a point of difference over driving and flying, to chase speed by cutting out connectivity or greatly increasing delivery costs is a false economy, it’s just a marginal gain where you are already ahead on various other factors. Once we have trains running both ways nice and frequently then we can start looking at improving travel times. Absolutely agree, and of course it isn’t a two hour trip for those from or to intermediate stops so in a sense by serving these places you are actually offering a shorter service for some of the users. Also those that must have a quicker trip are not the target market, especially as compared to driving the time on the train is not lost, it can still be productive: two hours online versus 1.5 driving? I for one would find the former less of a time loss than the later. Anyone who thinks it takes less than two hours to drive from Hamilton to Auckland in commuter traffic hasn’t attempted it for a while! Most Hamiltonians allow 2.40 hours now to drive into Auckland CBD, if they are leaving the Tron at 6.45am. Nick you’re thinking far too practical for me (I said you’d put a lot of though into this) I’m trying to dream here! I accept there’s practical problems with only a single track in each direction and lumbering freight trains to pass. I’m dreaming of a two-track scenario where the fast trains woosh past the local stopping services and the trains full of logs and coal. Also, as an ex rail commuter and traveller I can assure you fast trains make a BIG difference in travel choice. (Even Matt wants AT to say how their new electric trains are “fast FFS!”) Don’t forget the greatest numbers of rail users (i.e. income) occur during the morning and evening peaks – these people don’t care if there’s a regular train during the day because they’ll never use it. Shaving 30 minutes off an Auckland to Hamilton trip each way means an 1 hour saved in total. That’s huge! Do you start fast and increase the frequency or the other way around? I’m sure there’s plenty or arguments both ways. Somebody will have the data to show which is better. I’m simply offering a user perspective. Maybe what’s more important is that running the service in either form would presumably in due course demonstrate demand for a second track to be built. I don’t know if that is actually true GMC, or rather if it would be true if we had intercity rail services. On the Auckland suburban rail and buses there are actually more off peak users (and income) than peak. Now of course the peak lasts for ten hours a week, and the off peak for about seventy. It is true there is a greater intensity of travellers at peak times (thats the very definition of peak), but not greater numbers overall. That is an important consideration when it comes to profitability, you usually can’t make a transit service work on the peaks alone, its too much sunk cost in vehicles, plant and staff to recover from such a short period, you need to recover it all day, seven days a week. I would also argue that in this day and age all day services are important even to commuters. Is anyone so confident in religiously fixed start and end times that they could make a decision to live in Hamilton and work in Auckland with only one train a day that works? What if you have to work late, start early, stay home to visit the doctor then go to work, meet clients or friends for a drink after work, come home in an emergency, etc? Somewhat paradoxically, I think the promise of ready access to later or earlier trains is what will boost peak patronage the most. There is an adage in transport planning that the last service of the day is the most important because nobody uses it. What that means is very few people will rely on a single service, nobody will plan to catch the last train home of the day because the risks of missing it are too great. But you need it there as the backup, the fall-back option, otherwise people won’t take the earlier train either. Focussing on fast peak commuters means cutting back on regularity, all else being equal. Regardless, I think there is only one feasible way to begin, by servicing the largest market possible, both spatially and temporally. Starting fast means starting with a much smaller pool of potential customers, the only people who could use it would be people who live in Hamilton and commute to Auckland each day. For one you’re cutting out the people who live in the towns of the Waikato who are probably more likely as commuters. Personally I don’t think there will every be that many people commuting every day from Hamilton to Auckland. North Waikato yes, other business and leisure trips yes, but not many workaday commuters. Get the connectivity, get the access, get the reliable schedule that people can use to support a normal flexible lifestyle, then look at improving the speed. An interesting article and I have not yet had a chance to read the whole thing, but for a good example of this sort of service already in operation you only need to look at the Wairarapa line on the Wellington suburban line. When I travelled on it to both varsity and later work in wellington and the hutt valley there something like 600 regular users on 2 “workers” trains in the morning based out of Masterton and travelling into Wellington every morning. There was also a “shoppers” train mid morning and returning early afternoon. The two trains both stayed in Wellington all day and returned at night an hour apart, along with a bus service an hour later for stragglers. I understand similar numbers still use it and it was a good service, but now the locos are based in Wellington and travel up empty every morning. When I was a little kid my mum and grandfather would take me to Auckland from Te Awamutu for the day on the train. We caught the early morning railcar that did the New Plymouth to Auckland trip and we would get the Express home after dinner in the old railway station dining room (white table clothes, chips and gravy on everything). This was early 70’s. The railcar would stop on request at little places without even a platform like Ohaupo. The biggest delay was stopping at Frankton for 20-30 minutes so all the old people could have a cup of tea. To make it work now would require refreshments on board and toilets and small fast units. The old two car railcars even allowed for standing passengers if the seats were all full, but you didn’t need a booking. They made it too hard to travel by train and then killed it completely by not stopping at most places. Awesome work Nick – I would definitely travel more to Tauranga if that service was available. I find the car journey a white knuckle ride plus we have a little girl who gets very car sick. The biggest thing I miss from Europe is train travel and I am sure once NZers had a taste of it (again) they would embrace it. I used to travel from Christchurch to Seddon/Blenheim when I was a kid (in the 1980s) for school holidays. From the old Moorhouse Ave station (later the cinema and demolished now) – which was huge. It was an amazing experience and something I remember even now over any car journey. If you want a brand for this rail service then I suggest painting it light calling it the “Blue Streak”. Most of the old railcars were red but everyone new the blue one was better. The blue streak finished its run in 1972. To speed up the journey, tilting trains could be used – http://en.wikipedia.org/wiki/Tilting_train While I imagine these would cost more, the faster journey would make them more attractive, therefore boosting patronage. Saloon seats, notebook power, Wifi yes indeedy. Not so sure about baristia and cafe service, that needs a fair whack of space on board and it needs staff to man it… but if done right could be a positive revenue stream. Perhaps the is a sweet spot where a single train manager can manage the doors and ticketing and offer a reasonable range of refreshments. I wonder if that is something for the staging. Start with double-car DMUs (two power cars) that are basically 3/4 seating space and 1/4 drivers cabin, toilets, luggage etc. Then if business picks up add in a centre trailer carriage that is 3/4 seating space and 1/4 cafe. Also a couple of other innovations I’d like to see, one is reversible seating where each pair of seats can spin to face either direction. You just pull a little level and push it round on the spot. This is very common in China but I’m not sure about anywhere else. At each end the staff simple walk the length of the train and point all the seats in the right direction, but if you are travelling as a foursome you can simply rotate one set to make a booth. In Germany they have quiet rooms which are basically facing pairs of four seats around a table with glass partitions and a closing door. Good if you have business to do, or if you are travelling as a family. You could simply price them at the cost of four seats. They tried a café on the Wairarapa line, but it failed and never made any money and those trains were 6 car units with about 300 on them. They did have reversible seats that did not turn but flipped over and worked really well. The seats were pretty basic, but comfortable. The current carrages I don’t think have those but the seats are much bigger and heavier. I find flip over seats tend to be compromised in terms of comfort and position from the need to work on both sides. That why I like the rotating ones, they are just a normal quality ‘one-way’ seat that can point in two directions. Rotating seats are common in Japanese express trains such as the Shinkansen and Narita Express. At the end of the run, passengers disembark, the train manager checks the cars are empty, and presses a button to spin all the seats (IIRC the spin is staggered as they can’t all spin together) before the cleaning staff come through and then the next load of passengers get on… all in less than ten minutes. Nick, in Japan on inter-city express trains, including the shinkansens, they have staff with trolleys like on airliners that offer snacks, mags, newspapers and drinks etc. That could be something offered without having a bar zone taking up substantial space. The Shinkansen trolleys also carry lunch box meals (full meal in a box with amazing variety of food) and dispenser Thermos tanks of coffee. No, it’s not barista level, but it’s not bad (especially compared to the coffee you usually get in Japan). As SImon said, it offers great service without taking much space. – Why not more services to Tauranga, maybe one every second hour? – I think that 2 hours from Hamilton to Auckland may be a little slow and should be made as close to 1.5 hours as possible. Could this be achieved by dropping many of the smaller stations back to services every 2 hours and alternate between them? Also would suggest to put these services through Manukau and cut all other Auckland stops; this would allow for connections to the airport and also provide an express service between Britomart and Manukau. Gary without the luxury of a dedicated line through Auckland metro your 1.5 hours will be nothing but a pipe dream, even 2 hours could be a bit ambitious with being stuck behind an all stops metro train from Papakura (54 minutes to Britomart) there may be a few minutes of time saving going via the eastern line. Little under 2 hours should be doable just with the third main to act as passing loops for intercity trains, still miles quicker than driving in any sort of traffic. I didn’t word that very well Sailor Boy, by dedicated line I was referring to the third main and that is some time away and even then it will only initially go from Wiri to Westfield. With a third main giving a clear path through Auckland 1.5 hours would be potentially feasible, if difficult. That would require an average speed of 93km/h over the 139km from Frankton to Britomart. To achieve that with say six intermediate stops, you’d need short dwells at stations and trains that can stay at speed of 110-130km/h pretty much all the time they aren’t stopping for passengers. So that’s feasible, but you are into the realm of higher speed tilting trainsets, track and signalling upgrades and priority over freight in parts. I see no reason not to aim for that, but in the short term two hours seems like a good target. Then you need an average speed of 70 km/h. That seems feasible with the existing track and conventional rolling stock, provided you can operate it with some priority. Nick a 70kph average speed with 6 stops and the third main only going from Wiri to Westfield (eventually) is pretty ambitious, the standard line speed along with any speed restrictions on the line would not allow high enough speeds to allow that sort of average. Or, we could study history, and see that no one could actually make this work profitably. When the time came for this service to sustain itself without massive public sector subsidy, it couldn’t. End of story. Yeah cos let’s face it nothing ever changes and nothing new is ever possible, and no mistakes were ever made in the past. End of story. So what’s changed to make this more economic than before? The road between Auckland & Hamilton is better and faster than it was when the trains were running regularly, it only takes an hour and a half to get there by car off-peak. So what’s the target market here – people who want to go to Hamilton, have time on their hands, and aren’t particularly interested in scenery (the scenery between here and Hamilton via train doesn’t offer much in that regard). Kiwirail couldn’t make the line work before, what’s changed? Clearly you haven’t been caught in a Hamilton traffic jam lately. Or a Tauranga traffic jam. Or a holiday time traffic jam on SH2 south of the Bombays. Or a holiday time traffic jam on the Southern Motorway. There are huge benefits to this proposal in terms of frequency, amenity etc. but don’t forget that many roads, even the wide new roads in the region, get congested. Who’s talking about the 60’s? Train services to Hamilton & Tauranga in the 80’s and 90’s were a commercial failure. Anon, the fact Kiwirail couldn’t make it work isn’t saying much. Most people in Hamilton and Auckland didn’t even know there was a commuter train last time until it was announced the service was ending such was the dearth of marketing of the service. Me thinks also particularly for people travelling to Auckland, and its CBD, it may take rather a bit longer than you’ve noted once you’ve actually got into the central city (think Auckland traffic) and then found somewhere to park. But let’s not let those minor details get in the way of your beliefs. Ummmm – let’s see. For a start it wasn’t KiwiRail that trialled it, but a private company that had no real interest in it succeeding. Then there is the major population increase since 2001, including the recent trend for Aucklanders to move to Hamilton for affordable housing while keeping their Ak jobs and then there is the increased congestion and petrol prices since 2001. Just a few important things that have changed. The TranzAlpine is a popular train service, and turns a healthy profit without a single cent of subsidy. If they can make that work profitiably then surely there is a glimmer of hope for the rest of the universe? Nick R – but the TranzAlpine is a success not because it’s a train but because it’s a well-marketed day out of international repute. It’s in the discretionary expenditure market, not the transport market – it’s competing with Orana Park, the Gondola, swimming with dolphins, whale-watching, skiing, the Antarctic centre and everything else people get up to in their leisure time in Canterbury. Very few people actually want to go to Greymouth. There certainly is a glimmer of hope, but emulating the TranzAlpine’s success without its success factors can’t be part of that. How about a bit more “how we can”, Anon, and less of the “why we can’t” (or couldn’t, once upon a time)? Yes, agree with the BigWheel. We need positive, not negative thinking. Nick R is right to start small.when successful the project will drive itself for track upgrades. Needs people support though to combat Kiwirail killing it through claiming freight trains take priority. Which would be a strong argument except for the way we fund roads. I’d buy eight or ten Hamilton-Auckland one-way trips a month on such a service at up to $50 a time. I’d be funding that by not keeping a car park in Auckland, not running a car for that purpose, and from the savings in road user charges. I don’t know about you, but I pay four digits a year in tax to keep the roading system going. I haven’t heard of that making a profit lately. Exactly – it constantly amazes me that rail has to make a profit but roads don’t. It is such blatant double standards but mostly is a consequence of that fact that most people dont know how roads are paid for. I think such a service could work very well, especially if they could (literally) cut corners and get the timing down to 90 minutes. That’s less than many people’s current commute, and no doubt it would bring life to many of the satellite towns along its route. It would need a redesign of NZ’s rail system though. Notably pulling the physical rail layer into another, neutral company that resells it to users (Kiwirail, etc – like we have with Chorus). Also addition of sections of adjacent rail so that cargo services can be passed by faster passenger ones. I love the idea of rail to Tauranga – my fiance’s family live there and the bus ride is diabolical. For c$50 million, it seems like a no-brainer. That’s… let me guess, the cost of a couple of motorway on-ramps? – You haven’t allowed for the cost of ticketing etc. Who’s going to run this thing – they will have their own organisation which will need to be paid for (you know, like ticketing offices/staff, finance people, IT people, CEO, and so on). – You simply waved your hands past the access costs, which could be significant. What other costs are there involved in all this – you start running more trains, will more people need to be involved in Kiwirail operations and therefore they’ll put the access cost up? Actually you are right about all those things. Similarly State Highway 2 requires people at NZTA to manage it and people to be employed to maintain and improve it and worst of all it needs heaps of government money- perhaps we need to close it down completely? I know you’re being sarcastic, but those costs would have to be included somewhere. This isn’t a charity train service is it? Someone has to pay for this stuff, and it’s simply not factored in to the costs above. And they could add significant cost, which could change the profitability profile considerably. If you don’t include all your costs, how can you accurately model how much a ticket should cost? I said above that I assumed the trains could be kept and serviced at Frankton yard. Perhaps that needs some money to fence off a section, but no I’m not saying this would need a huge new state of the art depot for six or seven trains. I have allowed a million dollars a year in the costing for corporate costs, including ticketing offices and management staff, that is noted above. Yes, I noted that it doesn’t include access costs which could be a couple of million a year if they are very silly about it. This is all generally predicated on the idea that a different government could direct Kiwirail to run such a service. Would kiwirail charge themselves track access costs if they were being directed to run a successful service? Perhaps that is worth reiterating, this is (perhaps) a reasonable estimate of the economics of such a service if the government and Kiwirail were serious about delivering one. It’s not a reasonable estimate of the costs of a private operator trying to enter the network in the context of an uninterested Kiwirail and an obstinate government. I had considered commuters going the other way, but that is probably a quite small market so not something to look at initially. The problem is if you want a train in Hamilton before 8am it needs to leave Auckland before 6am. That means you either send one up at about 4am in the morning, or you have to base trains in Auckland. Both doable but expensive complications. The ideal situation would be to have about 1/3 of the fleet and staff based in Auckland, 1/3 in Hamilton and 1/3 in Tauranga. Then you could start early at each end and in the middle and run them all day. Problem is that means three times the facilities, three times the staffing overheads, etc. I think that should be a latter goal. Start with a smallish fleet based in Hamilton, then once that is working well on an hourly schedule consider adding fleets based in Auckland and Tauranga to run hourly both ways between those two cities. This would allow for early morning departures ex Auckland and Tauranga, and would boost the Hamilton-Auckland leg to half hourly frequencies. The ex fire station site is currently held by the office of treaty settlements in anticipation of the Tauranga Moana Iwi Collective settlement. In my experience iwi are clever business minded groups, so they might be right on board the idea of having a train station next to their commerical devleopment land. Anyway the fire station site is perhaps a red herring, the easiest would be the corner of the yard just behind it which I assume is controlled by the port. As it stands, there are more coach services between Rotorua and Auckland than there are between Tauranga and Auckland. Taking the obvious traveller’s mentality of using public transport into account, and patronage, wouldn’t it be more sensible to re-open the Rotorua line? Rotorua is indeed a big destination for international tourists (but maybe not so much for domestic? ), however there are a couple of major issues. For one the line is mothballed and in a bad state of repair, it would need a lot of work to bring it up to standard. Secondly the bit leading through to the Rotorua CBD has been lifted and doesn’t exist at all, so getting a station in a good location is an expensive proposition, you’d probably end up with a terminus in the outer suburbs. Thirdly the bit of line in the outer suburbs is leased to a tourism operator to run little buggy things. All up that’s tens of million of extra capital investment to make it work. In comparison Tauranga features a well maintained active main line, and the opportunity to easily build platforms in ideal locations. I say start with Hamilton and/or Tauranga, then if it works well look at putting the money into Rotorua. Rotorua is a much larger market for international tourists and my understanding is the majority of them go via charter bus services. A rail service (especially from the airport) could compete with this if it was quicker and cheaper. For local traffic, roughly twice as many people fly AKL-TRG as AKL-ROT which indicates Tauranga would be a busier line. Wouldn’t that be because the Auckland/Wellington bus service routes through Rotorua? Exactly what is required between New Zealand’s largest city and New Zealand’s 4th (Hamilton) and 6th (Tauranga) largest cities. Residents in both Hamilton and Tauranga (especially) support a regional passenger rail link to Auckland. I agree with a stop at Papatoetoe for the airport connection. CAF makes DMU’s, so they could bid for the supply of the 7 or 8 DMU’s required for the tri city rail services and since they have the maintenance contract for the the EMU’s they could have the maintenance contract for the DMU’s. The residents of Tauranga would support a regular rail service as oppose to increase bus services between Tauranga/Auckland/Tauranga. The rail service between Auckland/Hamilton/Auckland would not have to much of an impact on InterCity’s 12 return daily services, as only 2 of the services are over night stabling of the coaches that are used on the Auckland/Napier/Hastings services. Need to remove road mad government as replace it with Labour/Green government or mother nature will force the issue with the increase effects of global warming. 4th and 5th biggest, really – Tauranga overtook Dunedin around five years ago. And continues to grow at a pretty good rate. The Capital Connection train is the only other service similar to what you are proposing in NZ so might be worth a comparison. It currently gets close to 150,000 trips/year and is steadily declining in patronage. However Hamilton and Auckland are much larger than Palmerston North and Wellington so I’d imagine 365,000 trips/year on the service wouldn’t be too much of an ask. The Capitol Connection is the Palmerston Line only. The more viable similar service is the Wairarapa Line which has been operating for years. I’m not sure what its numbers are doing now, but it did deteriate a few years back with delayed trains and the old carrages being an issue. * the parallel drive is long and slow, over the Rimutaka Hill. If the parallel road was generally 100km/h, as in Waikato/Horowhenua, the picture would be very different. So, as Thomas says, the Capital Connection is the only service similar to the proposal. Yes Mike it is all in one region so the funding model is different. The road itself is not that bad. I drove it for about 5 years and its been done up since then. When I drove it the time to travel from the Wairarapa to central Wellington was the same by road and by train, so I don’t think the road makes any difference. The Capitol Connection is failing as the Manawatu does not have as strong a communter basis to it as the Wairarapa which for Wellington became the affordable housing area for families starting out. It’s become a bit different now, but is very similar to what would happen with a Hamilton line where I would suspect the satellite towns would become the major attractions with commuters from there in the first instance and less from Hamilton itself. Hamilton has a big enough employment base, but the small towns like Huntly would be opened up to become commuter towns far more readily just like Featherston has become. The reason the Capital Connection is failing is a little more complex. Wairarapa trains have better frequency, they are also an integral part of the Metlink network. The Capital Connection is not part of the Metlink network, so therefore a double whammy – competition with new frequent Waikanae commuter trains, and it is not part of Metlink’s integrated ticketing which fundamentally affects such things as 10-trip and monthly passes. Under this constraint, a single non-subsidised commuter service per day is going to struggle against Metlink’s subsidised high frequency Waikanae commuter rail. The other curious aspect is that Wellington (and the NZTA) is happy to subsidise the Wairarapa service which falls within its territorial boundary, but will not fund the Capital Connection. The Transmission Gully RoNS is another factor. Altogether some murky politics are at play at both a regional and national level working against the Capital Connection. These sorts of conflicts are precisely the sort of thing to avoid if long term success is to be achieved with a Waikato rail service. David – if you think the area served by the Capital Connection doesn’t have a strong commuter base, just look at SH1 in the mornings! The reasons for the Wairarapa Line’s success are regional funding, and competitive advantage over the road. tuktuk – GW is happy to subsidise the Wairarapa Line and not the CC because the latter has only Otaki within its boundaries not already served by subsidised rail. As NZTA acknowledges, Transmission Gully will reduce Kapiti Line patronage by over 20%. So I don’t think the politics are murky at all – GW doesn’t want to spend money on people who don’t vote for it, NZTA is doing what it’s told by the government. Substitute Auckland Council for GW and Waikato Expressway for Transmission Gully etc, and the two situations are directly comparable, unfortunately. Mike, It has a strong commuter base as far as Otaki, but not really further. The Wairarpa has a much stronger commuter history to it as evidenced by the number of trains. As Nick says, one train just does not form a commuter basis and I know when I was commuting, if there had only been one train then mi probably would have driven instead. It would be interesting to know if you have similar figures for the Wairarapa Line. Yes, you have raised an interesting point regarding cross region subsidies. Getting GW subsidy on this was always been as much a political foot ball as a regional one and if I recall that was why it was funded by NZTA initially as the local MP’s were hammered about it and the potential loss of the service. For NZTA the benefit was not having to upgrade the road which would be a huge cost for a limited number of commuters. And talkig of the Capital Connection, the Business Case for its continuation is at http://www.horizons.govt.nz/assets/publications/getting-people-places-publications/Capital-Connection-business-plan.pdf. That gives an annual cost of one return train per day, Monday-Friday, of roughly $2.5m, ie $5,000 per trip. The costings for this proposal work out at about $400 per trip, ie over 90% less. Knocking off KiwiRail’s hook & tow charge, track access fee and allocated costs, the CC still costs about five times as much per trip just for the carriages (unpowered) and on-board crew (excluding driver) – and that’s with all assets fully depreciated. So, I think another look at the costs would probably be a good idea. That’s kinda the point Mike. The cost of a single return train will never be very effective because you are loading all the costs onto just one run. Trains have high setup costs, high fixed costs and high overheads…. yet low marginal costs once those are covered. The Capital Connection is perhaps the perfect example of what not to do. If air New Zealand existed to fly a single plane down to Wellington each morning and back up in the evening, five days a week, the cost of running that plane would be astronomical… but they don’t, and you can get a ticket for as little as $39 at the margin. How many staff are employed on that train to make one return trip per day? I’d hazard probably three or four for a single return service if they cost it at just under $300,000 a year? That’s about $1,200 for each return trip, or about $300 per service hour. Absurdly inefficient, but understandable if you need to employ several people just to make five return trips a week. I’m suggesting that with the right timetable two staff can do two return services, or four times the staffing efficiency. If one staff member can do four trips a day, and fuel is consumed at a litre a km then marginal costs of just under $500 per segment seems perfectly reasonable. Note that a marginal cost of $500 a segment isn’t the same as a total cost of $500, not least because of the investment in tens of millions in vehicles up front. Consider it the cost of running the last train, not the first one. That’s why starting with a ‘big bang’ of 36 trips a day makes sense in a lot of ways, you need to offer a broad product offering to a wide range of customers, and you need to hit a big enough size to achieve some economies of scale with your operation. The Wairarapa trains had a good solution to the staffing issue Nick. They would employ the two drivers and one guard on each train and supplement it with regular commuters who would get free travel and act as guards for the trains they were on only. It worked well and was a good means of keeping costs down. OK, Nick – agreed that poor utilisation increases the CC’s unit costs, but taking out the costs I mentioned essentially leaves the marginal costs for the only similar operation in NZ, and therefore useful at least as a base for a costing model. Air NZ operates in the substantial all-day Auckland-Wellington market, so it’s difficult to see the comparison there – and many of the CC’s costs do benefit from economies of scale, eg half its stations, its locos, ticketing system, management, marketing, drivers, track, signalling, maintenance facilities etc. And if the CC were “hopelessly inefficient” wouldn’t GW and Horizons have recognised that in their business case? It’s not in their interests to talk costs up or revenue down. But before you operate the last train you have to pay for the first one. So, who is going to pay the millions for the cost of funding and depreciation of the vehicles and stations? Someone has to! Well the way I read it, that business case is an admission that it is hopelessly inefficient! Seriously, ten grand per return trip?! Who is going to pay? We will, as taxpayers most likey. Well like I noted above this is the sort of thing that gets started with a government funding package. Call it a regional stimulus, or a election bribe, or a nation building exercise. A railway of national significance even. A $50m handout from the central government coffers would do just fine for funding the vehicles and stations, and their depreciation. Certainly fifty million is nothing compared to the likes of Transmission Gully or the Holiday Highway. For many years, Capital Connection was in fact one of the very few commuter trains anywhere to cover its direct operating costs. I know that costs have increased somewhat in recent years in regard to the loco hook and tow, however the carriages themselves are low cost to operate. Victoria is interesting – it is in fact very hard to locate what the operating cost ratio is for the Vlocity operation. Someone told me they cover just 20 percent of their total costs – not sure whether that includes interest on the original CAPEX. The information I could locate compared costs with total benefits,eg improved economic activity in the regions. Under this sort of total costs and benefits package (in NZ terminology WEBs), the Vlocity operation is viable. Nick – I think your costs are light, but I also think that economic studies of the WEBs would show your proposal to be very attractive, likely more credible than just about any one of the RoNS. For a Waikato intercity rail service to be viable they need to cater for local commuters – Huntly to Hamilton, which has a relatively frequent bus service; Pokeno/Waiuku/Pukekohe to Auckland which is not well serviced or at all – as well as intercity travellers. So it has to be roughly as cheap as the current buses and faster, or it won’t be used and will be a failure like the Helensville trial. The Wairarapa line only has five trains a day, and I can’t see an hourlyWaikato service being too well patronised between Pukekohe and Huntly outside peak. * I’m not sure that you’ve captured all the direct costs, for instance the costs of funding the capital needed to purchase 21 vehicles and build 10 stations, or depreciation, or maintenance. There would also be an allocation needed of things like track access costs – I can’t see a new operator being given a free ride on the back of existing ones. 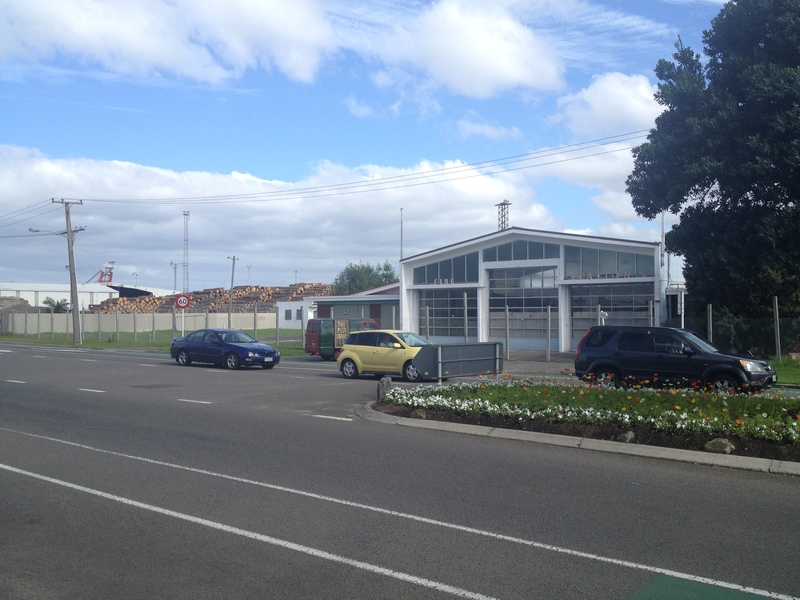 * There’s no yard at Frankton – presumably you mean Te Rapa? * I’m not sure that doubling or building a station at that site in Tauranga would be cheap or easy – cities are very protective about their waterfronts. * A minor point – it’s Claudelands, with an “e”. I insinuated this in the introduction, but what I’m looking at here are the sorts of costs for a government funded and owned initiative. So yes that assumes an election year bribe or other such capital injection without the need to consider costs of capital or depreciation, or for that matter ongoing profitability. Although it is true I haven’t accounted for maintenance, I have no idea what that might be. That goes the same for track access costs, I assume the could be waived by a proactive government directing Kiwirail differently. The crewing calculations are about 5% overbudgeted, in addition to annual leave, to account for holidays and sick leave and the like. Not sure if that is enough though. The timetable is indicative, a case of starting with a two hour trip and dividing it up. You’ll notice it’s all in simple five minute intervals. It might be a case of slower through to Papakura then faster from there to Britomart on the third main. Te Rapa it is then! The point is to just use what’s there already, I thought there was a yard at Frankton but maybe it’s just a couple of private sidings? I do think a platform and extra track at Tauranga would be technically cheap and easy. It is level, flat, unconstrained and spacious. However I do take your point that it might be politically difficult due to the waterfront location. Immediately south of Spring St looks like a well located but not too invasive place. Otherwise simply adding a platform to one of the tracks up at the multi track section next to Dive Cres might be easy. Having said that, the Tauranga waterfront is totally covered in acres of parking so they can’t be too precious! Nick R – nice post there and I can see a whole heap of thought has gone into this. A few comments – timetabling needs an integral airport link. If the trains aren’t to go via the airport from Puhinui, an equally good solution is guaranteed cross platform transfer to a waiting airporter bus at Papatoetoe train station which would become an integral stop in the regional train timetable. After frequency, which you have dealt with very well, quality infrastructure is a high priority. Any government wanting to embark on such a scheme will need to put a decent sum of money down on a third track through South Auckland (I cannot see how a Hamilton train is possible without it), and a commitment to maintain tracks throughout to support consistent 110 kmph operation summer and winter (no Heat 40s). An extension to Tauranga may require a long passing loop or two, and maybe extraction equipment in the Kaimai Tunnel to deal with diesel fumes from the many freight trains before passenger trains pass through. Victoria’s Vlocity project has encouraged people to live in lower cost homes in rural areas and then commute to say, the outer reaches of Melbourne as well as core CBD areas. The Vlocity operation integrates with the Metro services for seamless connections. Vlocity has encouraged businesses to relocate knowing that clients in downtown Melbourne are a simple, reliable train trip away. And, most importantly, it has also encourages baby-boomers to move out of Melbourne, freeing up houses, while maintaining links to family, jobs, friends, events, shows etc. Such a scheme requires time for the development to follow. In the past, trials to Hamilton have been short term and ad hoc. To be credible, a regional rapid rail needs to be a very clear 10, or ideally 25 year commitment. When the DMUs were introduced into Auckland, a 10 year contract was set up with then Tranz Rail. Something similar needs to happen here. Brand new Auckland – Hamilton (big bang) versus Pukekohe – North Waikato extension (incremental approach using mechanically re-built ADLs or extended electrification)?…..the answer there I think is going to be on the timeframe that a government is prepared to commit to. Auckland – Hamilton is a 25 year commitment to transit oriented development along the corridor, North Waikato you could fund as a 10 year project. Indeed, one thing with buying new trains is that you’re basically committing to using them for 20-30 years. So it would have to be a long term commitment. Yes, this is essentially a regional development tool, so would need a decent commitment. Nick – great job on this. Given there is alot of interest in Waikato rail (Waikato Times facebook page had over 1,100 likes by early yesterday afternoon + 130 comments, on 3 against) I do hope some of the political parties will put this into their transport policies for the election. I think that possibly $45 million for the hole package may be a little under the final cost, but I would say it would be somewhere between $45-55 million, which in the scope of transport projects is sparrow spit. NZTA are adding one lane to SH1 in Albany northwards. Length of the new lane is 1.9 kms and the cost is $19 million!!!!! Well yes $45m might not get quite this much but it is an indication that we can get something very useful for about that (or equally that an investment in $100m would allow wonderful things). And, just like the NZTA spend on one small lane, even $100 is peanuts and would be a truly amazing system benefiting Auckland, Waikato and BOP regions! Good work Nicolas – and I agree, a long distance rail service betwen AKL – HAM and TGA is likely within our lifetimes, simply because 1) population growth and 2) distances are too short for flying. Small incremental steps in this general direction definitely the way to go. I’d like to get the speed and frequency of the service up fairly quickly though … if you’re going to do something may as well do it well. Hi, followed the link from Twitter. From an Australian context, the cost is the bare minimum to get a service running on today’s railway. Some $$$ would have to be put in to catching up on deferred maintenance on the track and some opportunities to make small improvements. Resources to do small realignments of curves, minor deviations and so forth could pare precious minutes off travel time and allow for higher sustained track speeds, particularly using 160km/h ready V/locity-type DMUs. Also, the reorganisation of bus services in Hamilton North in particular might be useful to do timed connections to/from the University with trains. Speaking of which, a counterpeak service that arrives at 8.30am for a pre-9.00am arrival at Waikato Uni could be a useful offering. On both the Ballarat and Bendigo lines in Victoria, there are counterpeak trains like these that allow students and workers to get to the regional cities before 9.00am. Great concept and would be interested to see more. I would suggest a Hampton Downs stop would be smart as it’s likely to become a large scale development area – even just a temporary stop that only gets used during major events until the population base warrants a fully dedicated station. I think this is a great idea. Imagine the implications for those that work in Auckland but can’t afford to buy a house here. I think this has real potential, I already know several people that commute from Hamilton. I think reliable/cheap WiFi would be the clincher, effectively turning the commute into productivity. Very well written an thought out Nick. There is plenty of potential for regional rail services in NZ. Some of the cost of this proposal could be covered by getting part of the increase in property values that will occur around all the stations served by the proposed service. For example if there was an hourly rail service at Huntly to both Auckland and Hamilton, I am positive house prices in Huntly would rise spectacularly. This would be reflected in rates and in turn the local council should pay towards the rail service. This looks excellent but wouldn’t it be a good idea to extend the 17:15 Britomart to Hamilton service to Tauranga to allow a days business trip from Tauranga to be had in Auckland, or is this unlikely to justify itself, especially considering it would run back to Hamilton very empty from Tauranga? Also would it be worth running a service in from Huntly in the morning for those commuting into Hamilton? This could be the unit that forms the 08:45 Hamilton-Britomart service. Also in the longer run, a branch to Waikato University looks feasible, though could it ever be justified? Also to speed it up surely some of the smaller stops could be cut, Mercer’s role could surely be filled by Pokenoe, as there is very little there. You can do those things if you want to employ more crews, and in the case of the Tauranga service, buy more trains (or cut other services instead). I figured those wouldn’t be worth it, at least not to begin with. Yeah fair enough, though I thought both the morning train from Huntly and the evening train from Tauranga would require no extra units as the units are at the start/end of their respective shifts, though I entirely accept it may not be worth paying the extra crew for it, therefore making it a non-starter anyway. How much more expensive would it be to stable 1 unit at Tauranga to eliminate the nearly empty run in the evening from Hamilton and to lower the cost of the extension of the 17:15. (Though again I suppose its the problem of splitting where the crew are based that raises the costs for this to be unfeasible). Have to check my workbook but I think the one you proposed for Tauranga continues in rotation. The Huntly one could start early but it would be a case of heading up north at about 4.30 am to be in position to depart Auckland first thing. I suppose you could short run it just up to Huntly or something. I did consider an alternate where you base two trains in Auckland and two in Tauranga and have those bounce back and forth every two hours (four trains on eight hour round trips), then the last two trains based in Hamilton filling in the gaps to give hourly back and forth between Hamilton and Auckland. That’s a nice timetable, but it would require three stabling facilities and three crew bases, and it would complicate daily and scheduled maintenance (i.e. more capex up front). The trade off of basing everything in Hamilton for easy operations is the inability to start and finish runs in Auckland or Tauranga, which limits your ability to do early morning and late night services to/from those termini. Ok yeah that makes sense, yeah for the Huntly morning train I would see it starting there, I can’t see any case for it starting further North than that. Thanks for clearing this up. This was a particularly excellent post on what is a fantastic blog. Also I understand there may be a constraint with the third main, but ideally Otahuhu could be swapped for Papatoetoe as the stop in South Auckland, being more convenient for Maukau and airport connections in the New Network – presumably the main destinations in South Auckland, and been only two stops from Otahuhu the transfers to other rail network stations would be little different. On this date emu services will start papakura to akld and AT will have 5+ SA sets free, in fact kiwirail have told them they cant park them at westfd and AT will need to move them.Why not lease them $1 a year plus operating costs, will save AT a bundle.Puke has a stable yard all set up for 5 SA sets, will need to fuel at Te Rapa thou.Stations at hamilton, huntly, puke already set to go, add other stations as councils build platforms, sure tuakau, TK and ngurawahia wont take long.May need to operate hlz to kura to start.Aim small and grow.If numbers grow buy new trainsets and add tauranga. This idea needs to be “sold” separately as potential election winners to Labour and the Greens. It’s relatively easy to get appointments with an opposition leader. In Victoria the Regional Fast Rail project was an idea birthed by Labour while in opposition, and they took it to an election against an all-powerful conservative premier Jeff Kennett, who then suffered a surprise election loss. Initially $100m was allocated to upgrade 4 lines to 160 km/hr standard, but this was woefully inadequate and the eventual price tag of $800m was supplemented by funds allocated to regional development. An initial order of 38 DMU cars was additional to this price. Because of patronage growth the Vlocity DMU fleet has grown has grown to 134 cars with another 40 on order. The project has made a quantum change in the way regional Victorians travel to activities in inner Melbourne. Train is the new normal for regional Victorians to attend events and meetings in the inner city, rather than fighting against traffic and paying for parking. Last week I had a work meeting near Melbourne University, which was attended by 7 staff from regional Victoria, and 5 of these (70%) chose to come by train, while the other 2 shared a car and would probably have come by train had they been travelling alone. Two of those attending did not look at their briefing material until they were on the train, so they swapped relatively unproductive time in the car for productive time in the train. While there is a 9-5 commuter market, there is substantial patronage right through the day. Increasing speeds to 160 km/ha was probably not necessary to achieve this patronage growth, because there is little difference in travel time between the previous speed of 130 km/hr and 160 km/hr. As part of the line rebuild curves were super-elevated, with one track up to 15 cm higher than the other to allow faster cornering. This is more cost-effective than tilting trains, but it does increase the wear on the lower rail when used by slower freight trains. This is an excellent model to follow in developing a case for regional rail in New Zealand. Take it right to the Mount. I’d use it. I love the area and my sister and family live down there. If I didn’t have to drive (and not a fan of domestic air travel due to airports) I would be down there quite a bit more. Great idea Nick, great to see a proactive and well thought out approach to a modern day transport program for the “golden triangle” cities. I would be interested in you expanding a bit more on crew requirements or to be exact, shift breakdown and hours etc… It sounds like you are talkign about split shift crewing? Just interested on an operational level. No split shifts required as I’m proposing an even timetable across the day. Basically I structured it as a series of return runs ex Hamilton. Mostly Hamilton-Auckland-Hamilton, with a couple of Hamilton-Tauranga-Hamilton. The former is a 4.5hr shift (total return including layover) and the latter a 4 hr shift. A crew would usually do one shift starting and ending in Hamilton, then take a one hour break, then do a second shift starting and ending in Hamilton. So the shifts are only split insofar as they get a lunch break in between their first and second run. There may be some need for crews to do some single-shift days, and I assume they would rotate through early and late starts and weekdays and weekends. That was one of the big benefits of basing all trains and crews in Hamilton, it’s all very straightforward to plan crew rosters as all staff are based there, all runs begin and end there, and all runs are 4-4.5hrs long. Crew requirements were calculated by simply dividing the number of shifts a year by 480 (ten shifts a week by 48 a weeks a year) and allowing 5% leeway for sick leave etc. Now that I think about it those days are quite long, ten hour days with nine hours on the clock. It might be appropriate to only schedule nine sifts a week per crew (so four full days and one half day) or perhaps only eight (i.e four days on three days off, rotating). That would increase the staffing cost by 5% and 10% respectively. Would you not have the 8:15 from Britomart leave not so close to the Northern Explorer departure time? Doesn’t matter too much, Northern Explorer doesn’t stop until Hamilton anyway. On that point, Taupiri is completely unnecessary. There is a great and cheap bus service between Huntly & Hamilton so I would consider dropping off Ngaruawahia also. I would even drop off either Mercer or Pokeno. Pokeno is growing so I’d probably at least drop off Mercer. And a dedicated lggage car with room for bicycles as well as the appropriate advertising to promote the cycleways could be a possibility? Great work, Nick, by the way. Lets hope the idea gets traction, so to speak. Pun not intended. Kickstarter! As a Hamilton-Auckland sometimes commuter I’d definitely pay $500 for my annual pass. I have been pushing for a commuter train between Hamilton and Auckland for seven years, so it’s great to see you reinvigorating this discussion. The naysayers are always putting irrelevant barriers up, but getting this up and running is just a no-brainer. I would have fewer stops along the way for the peak commuter services than what you propose, but we are largely on the same page, so watch this space! Are the locos you recommend accessible for wheelchairs, pushchairs etc? I think there is a real latent demand here and a real chance of success, although it does rely on some planned infrastructure in Auckland to be delivered (the third main and probably the City Rail LInk) and a not insignificant level of investment and political support. Having said that the level of investment is still only equivalent to a smaller highway project. I agree with you on fewer stops, since writing this I’ve looked at it further and there are probably a few too many. Tuapiri and Mercer are just to small to warrant it, and really you’d only want one or maybe two in Hamilton and perhaps only one between Pukekohe and Britomart. I’d probably make that Puhinui or Papatoetoe to connect to Manukau and the airport easily. What I recommended aren’t locomotives at all but multiple units, but yes they would be level boarding for wheelchairs and pushchairs, although that depends on platform height. Outside of the Auckland suburban network they would probably need to be raised, which presents some difficulties. Good to see an MP on here. The 3rd main needs to be built either way. No need to stop at Taupiri or Mercer – they really are small places. So by removing those 2 should save about 8 minutes of the journey time ( so would be 1h52m ). The platform height should be a non-issue in a non-gold plated world… Put some boxing down, pour a strip of concrete to make them the right height – done, doesn’t even need to be the whole platform just enough for wheelchair access). Yeah I agree, looking at this again there is no justification to stop at Taupiri or Mercer. I would think about six intermediate stops would be plenty. This is a project that would definitely benefit from the rail network being placed under NZTA. It would allow them to look at the strategic benefits, and if necessary make the infrastructure improvements and also change priorities between freight and passengers. Nick ,have you lobbied Phil Goff, now that he is a strong contender for the mayoralty? Or the PPP Private Public Partnership arm of the Auckland Council? This should definately be a goer, considering all the expansion north and south of Auckland, including the new Pokeno developments and with more people moving into the regions. Maybe the Hamilton Council, Environment Waikato, PPP, and Auckland Council and Mike Lee should get together once the new mayor is in place? Jim I can’t see Phil Goff caring much about Pokeno as it is not in Auckland and they don’t vote for the Auckland Mayor, Waikato might come to the party but they have nothing to do with Phil Goff.